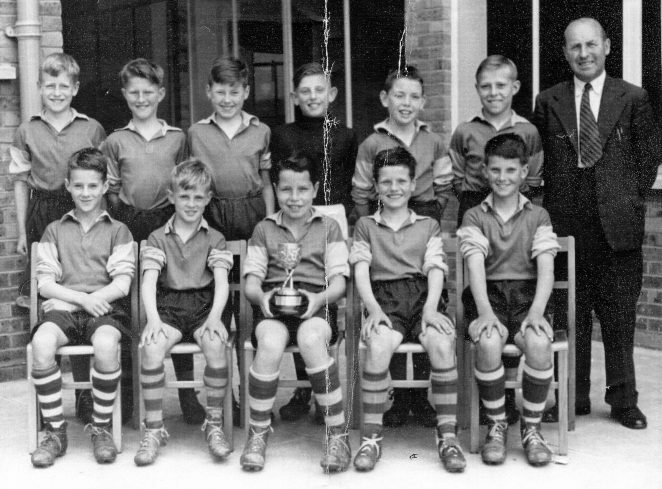 A copy of this picture of the Hertford Road School Soccer Team was found recently, and I have posted it here for interest. It would date c1954 but I stand to be corrected. Those that can be identified are: back row left to right: ? ?, Johnny Khuler, ? ?, Ged Healey, Pat Jeater, Rob Virgo, Mr Hickman; front row: Robin Hemsley, Peter Medhurst, ‘Chubby’ Dyson, Maurice Bowles (or his brother Howard – not sure which), and Terry Porter. I’d be interested to get feed-back on the missing names or to amend spelling. I believe two of the team went on to play at a higher level – Rob Virgo and Peter Medhurst. Unfortunately I wasn’t good enough for the team but three of the team were neighbours of mine in nearby Dudley Road. Hi Peter, I think your names are correct, and I believe back row, third from left is Alan King; whilst first left, back row, could possibly be Roger Grinyer. I am still in touch with Ged Healy, and also meet up with Robert Niblett often. I sent a copy of the photo to Robin Hemsley, one of the team, and he kindly went through and named the team. He confirmed far left is Malcolm Grinyer; Alan King too; Chubby Dyson as I remembered him was David Dyson; and it was Howard Bowles. He also copied me a certificate for they were winners of Howard Johnson Trophy Division 3 for the season 1955/56. Thanks Robin. Wonderful picture of such fine athletes. The season, though was surely 1955/56; had it been earlier it would have had me in it, plus Derek Girling, Howard Bowles, Pete Whitcomb, Reggie Adams with Howard Penfold in goal. Robert Virgo’s son plays for the Albion of course. The 1955/56 side was far better than 1954/55. The person on the far left, top row is Roger Grenyer-note the spelling. I met Roger about five years back at an Old Varndeanian re-union. Alan King is cetainly the other? The season: sadly spoiled by losing to Coldean. (There were tears at bedtime as well as the end of the match). Hi, I’m trying to trace an old colleague/friend called Pat Jeater. I worked with him at Courtaulds Research, Droylsden, Manchester during the late 1960s. I know he went on to do a Ph.D or M.Sc at Manchester university. If I remeber correctly he originated from Brighton. Could the boy in the picture be the same and does anybody know his current whereabouts? I was at this school when Mr Hickman was headmaster. Was Miss Young before or after him? I remember the sweet little beds that came out for us to have a sleep on, they were kept at the back of the girls toilets. I loved Christmas when we all sat cross- legged on the hall floor and the lights were switched off. All you heard was a bell, like reindeer sleighs, and a torch shinning in the window! Miss Young was headmistress when I was at Hertford Road. Mr Hickman, I presume, took over when she retired. Mention of Miss Young reminds me that I still possess a book given to me by Miss Young for being a ‘brave boy’ when I badly cut my thumb whilst on a school outing. At Christmas, didn’t we have to shout Zim Zala Bim for the appearance of Father Christmas? Came across this site by chance but the name Peter Whitcomb struck a cord. I can vaguely remember attending Hertford Road (must be around 1956-ish) whilst living at The Linkway. Later moved to the Queen’s Park area and St. Luke’s school, then Westlain. I remember Pete Medhurst become a useful player and representing the county, as I worked with him in the late ’60s at Radial Heating in Grand Parade and the boss always got angry when he had to leave early to fulfil his fixtures, whilst I was messing about playing for Preston Dynamos. Are they still going? I have Miss Young to thank for making me read. She dragged me out of class for weeks (maybe months) for extra reading in her office until I could read. I then spent many hours in Brighton public library picking books to read. I am delighted to read everyone’s comments and thanks for bringing back lots of memories – particularly the little beds and Father Christmas.